Tokelau Islands 1969 2 Christmas Plate Blocks of 12 1A and 1B VF Mint Never Hinged. Plate numbers and block position may vary. Blessed are those that are truthful. Scott's 3471A - Greenish Blue Color 57 Cents. Scott's 3471 - Gold Color 55 Cents. The Art Deco Eagle. Mi#2691-2698, Bl.527-Bl.528 EUR 48.00. Condition: Mint Never Hinged, VF. Prothonotary's Office. (National Vaudeville Artists). 2c GW Stamp. Pittsburgh, PA. Pittsburgh & N.V.A. Club. With signs of wear, use and age. so that I don't send it out without. not be able to combine. CDS 23 DEC 2010. Opened at top. Colorful mix includes 3 souvenir sheets and 3 complete sets. Tiberias (2nd Century). Scott #324. This is for 1 MNH. Mozambique 2001 Paintings by Salvador Dali 2 S/S Perf. Condition: Mint Never Hinged, VF. Mozambique Paintings by Wassily Kandinsky & Joan Miro 2 S/S Perf. Condition: Mint Never Hinged, VF. Then, I will send you an invoice. A Very Nice Collectible Stamp - A Great Addition to any collection. INDIA:2 DIFF.COMPLETE SETS ON PAINTINGS, COMMEMO.FU. A nice selection of 2 diff. These sets are : Indian Miniature Paintings (4v, 1973, SG#681-84) and Modern Indian Paintings (4v, 1978, SG#882-85). The FU sets are shown in the Pict. YELLOW SHIFT DOWNWARDS ON 1ST STAMP -SEE PHOTOS. Get Supersized Images & Free Image Hosting. 如果找到便宜？讓我們知道！. सस्ता पाया?. हमें बताइए! LAISSEZ NOUS SAVOIR! CDS 4 DE 1956. Opened at top and both sides. Drysdale CDS 6 JUN 2003. Opened on left hand side. Mi#425-430A, Bl.99A,B. EUR 22.50. Condition: Mint Never Hinged, VF. (Monaco 2019 Nudes in Art - Paul Gervais - Mint Never Hinged (MNH). Set of 2 values (2v Set): E2.60, E3.44. You will be back for more! 3) Select each item and 'Add to Basket'. Condition of this lot is mnh vf. Italy - 1975 Anniversaries of Italian Artists (2nd series). 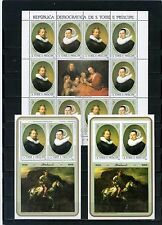 Complete set of 2 values - Unmounted Mint / Mint Never Hinged. & 2 S/S Perf. Mi#496-503A,BL104A,B EUR 25.50. Condition: Mint Never Hinged, VF. Single value - Unmounted Mint / Mint Never Hinged. & 2 S/S Perf. Mi#515-520B, Bl.39A,B EUR 14.50. Condition: Mint Never Hinged, VF. Mint never hinged Guyana 2014 150th Anniversary of Birth of Henri de Toulouse-Lautrec, 2v sheet Large collection of Thematics! Other things you should know. Guinea Bissau 2001 Paintings by Mark Chagall & Pablo Picasso set of 2 S/S. Condition: Mint Never Hinged, VF. Beautiful Full Color Glen Cachet. June 21, 2001 ~ Phoenix, AZ. Stamp Issue of 2001. The Actual Size Of This Cover Is: 6½" X 3¾". ~ Serving Stamp Collectors Over 60 Years ~. THIS IMAGE MIGHT NOT BE ACTUAL SIZE. 90c 'Banking' Living together stamp. Pictorial SYDPEX 88 CDS 30 Jul 1988. Sydpex cinderella on reverse. Sealed with contents.